This cake is an oldie but a goodie. I’ve updated the recipe with some new pics and put the traditional recipe and the Thermomix conversion all in one place. You’re welcome. Nuts are really good for you (unless you have a nut allergy of course,) and for me, walnuts will always be my favourite. Recently a friend told me that walnuts have been found to be a crucial factor against Alzheimer’s Disease which made me love them even more. I can not vouch for the validity of the claim, but I’m thinking it must be true, if only because walnuts are brain shaped, well kind of! I actually went to my doctor a couple of years ago and told her that I was worried about my superior level of forgetfulness. She told me that if I could remember that I was forgetting, I was all good. 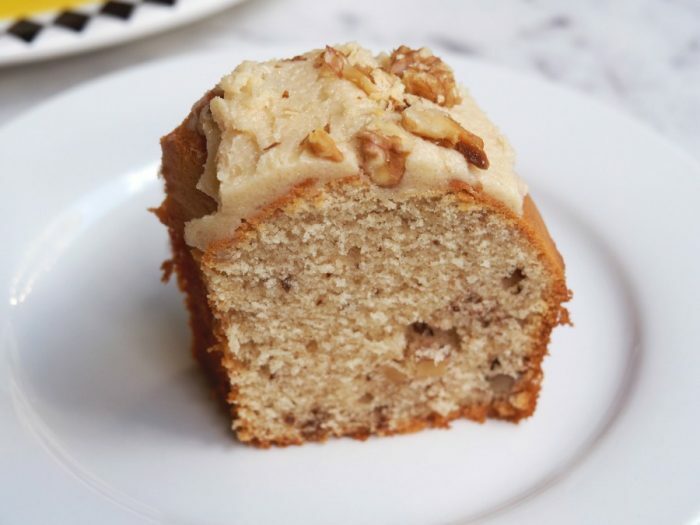 I guess in the meantime, I’ll just keep up my walnut levels with this delicious cake! All I need now is a nut that will improve my icing skills. 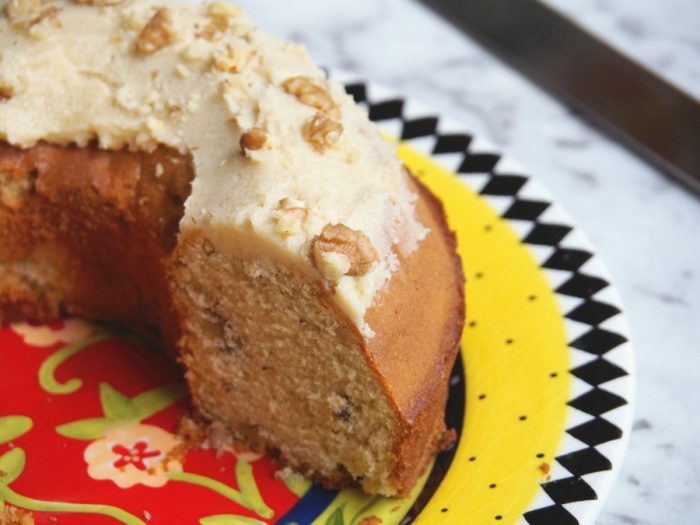 This cake is both rustic and forgiving, so do make the simple icing, it’s the tops! I milled raw sugar in the Thermomix for the icing which gives it a rather nutty colour, but it’ll be all white if you use regular icing sugar. Do you have a good memory? Are you nuts about nuts too? Preheat oven to 180C/160C fan forced. Lightly grease and flour a ring tin. Sift together the flour, salt and spice and fold into the butter mixture alternately with the milk and chopped nuts, beginning and ending with flour. Pour batter into tin, smooth the top and bake for 30-35 minutes. Remove from the oven and turn out onto a wire rack to cool completely. For the icing, sift icing sugar into a small bowl and beat in the butter and lemon juice until the mixture is smooth. 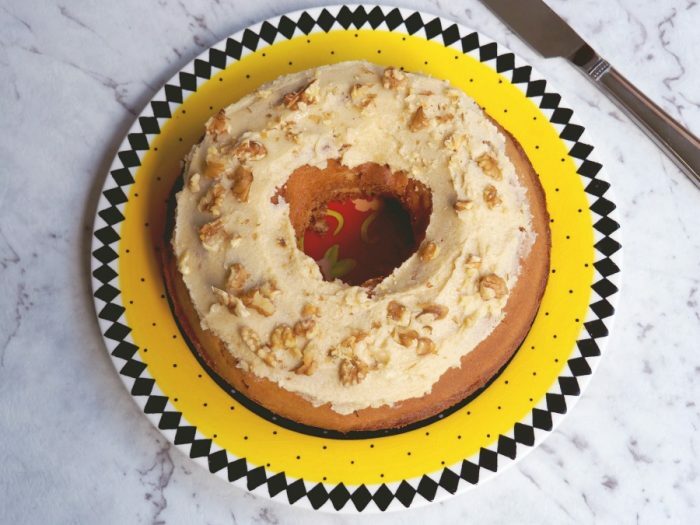 Spread the top of the cake with the icing and sprinkle over the chopped walnuts. Preheat the oven to 180C/160C fan forced. Lightly grease and flour a ring tin. Add the flour, salt and mixed spice into the TM bowl and mix for 10 seconds on speed 6. Set aside. Add the sugar and butter to TM bowl and mix for 30 seconds on speed 4. Scrape down base and sides of bowl. With the blades running on speed 3, add the eggs through the hole in the lid. This should take about 30 seconds. Add half the combined flour mixture and mix for 5 seconds on speed 4. Add the milk to the TM bowl and mix for 5 seconds on speed 4. Scrape down sides and base of bowl. Add the remainder of the flour mixture and mix for 10 seconds on speed 4. Scrape down base and sides of bowl. Add walnuts and mix for a 10 seconds on reverse speed 3. The mixture will be quite thick. Spoon into cake tin, smooth the top and bake for 30-35 minutes. Remove for the oven and allow to cool for at least 20 minutes before carefully transferring to a wire rack. 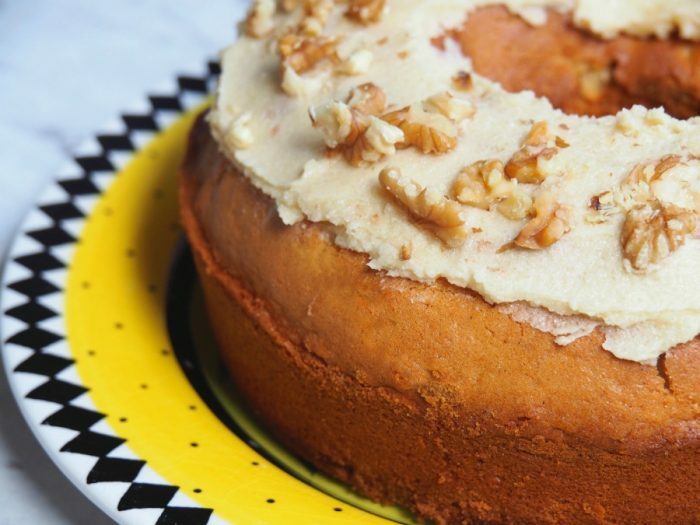 When the cake is completely cool, make the icing. Mill 125g raw sugar to icing sugar for 15 seconds on speed 9. Add 1 ablespoon butter and 1 tablespoon juice and mix on reverse speed 4 until combined. 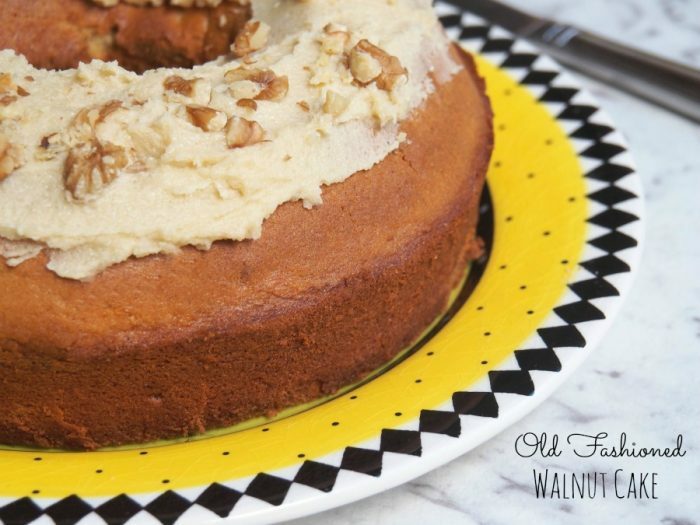 Spread the top of the cake with the icing and sprinkle over the chopped walnuts.